As most people turn to get there racing fix from GT Sport there is a game rolling over the hill and down a slippery muddy hill, in a big fat truck. 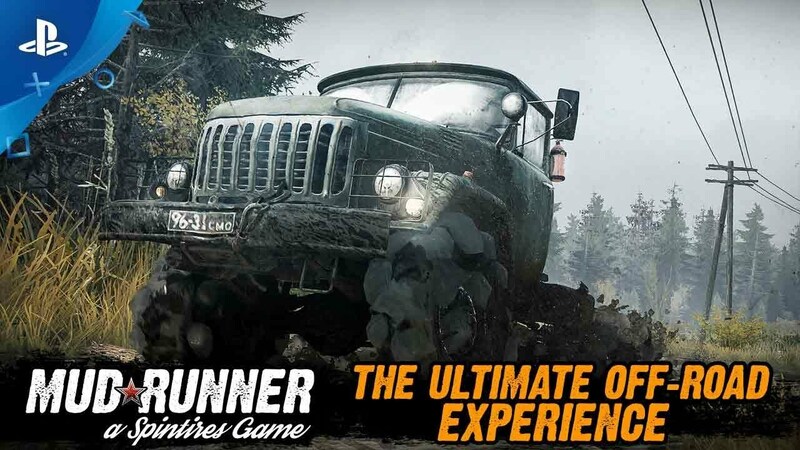 MudRunner will be so far away from anything you've played before, on any wheels come to that. Never having played a game like this before I have to be very careful on how to review it. You see not being familiar with this type of genre I'm having to be very open minded. I see this game as a puzzle game on wheels, VERY big wheels. You have tasks and have to solve them. Most are fetch and carry but you have to plan on the best way to achieve your objective. You have various 'rigs' at your disposal and using these to plan ahead and get the job done. You can even get online and team up in a co-op mode to half the burden and use team tactics to get the missions done. You can choose different trailers, carriers, cranes, pulleys etc etc and this choosing of the right tools and vehicle is crucial. You will get stuck, see my epic fail video, and when you do, trying to figure out how to get out of the mud is another puzzle in itself. The mud is the star here. 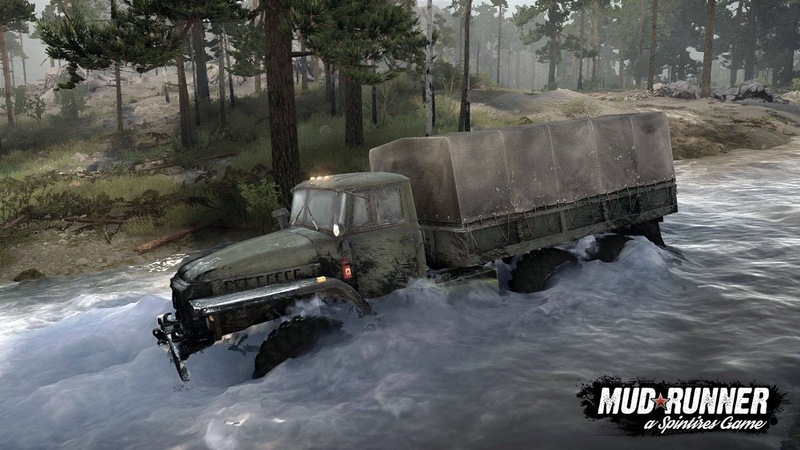 The physics are quite brilliant as it shifts about round your tires and clings to the paintwork, ploughing through water washes it off but it won't be long before you end up in mud again as it's everywhere. You really feel like your doing battle with the huge steering wheel as you wrestle with the terrain. Things can get quite tense as you start to slide off towards a river edge or steep road edge. You're not just thrown into the deep mud, a very well put together tutorial will hold your hand and really get you to grips with most of the perils that lie ahead. You will need to learn how to refuel and repair to succeed. As you go you will unlock garages and trucks, even complete bonus objectives. Your winch is your best friend. It will get you out of many a large hole that you get yourself into but don't be fooled, like I was, into thinking it will rescue you at every turn, it wont. You can attach to many a different solid objects and pull yourself out of trouble. 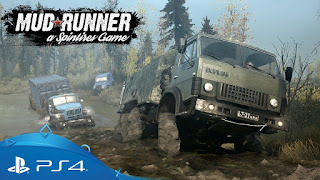 MudRunner is not going to win awards for great looks and next to some games it's fair to say it looks very last gen but that's not being cruel as the game does a great job modelling the trucks, the stars of the show, the world itself suits the game, dirty and rough. Sound booms out of my sub woofer when starting up the beasts and some or the 8wheel monsters really do make the floor shake. My dog kept looking up as another truck started up. The camera takes some getting used to and at first you'll be all over the shop with it but you soon come to realise why it pans wildly as you start to need to see all round your vehicle to avoid another slide to your doom. 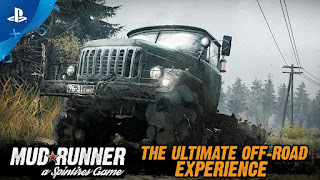 Hats off to the developer Saber Interactive, MudRunner is different and fun to play. 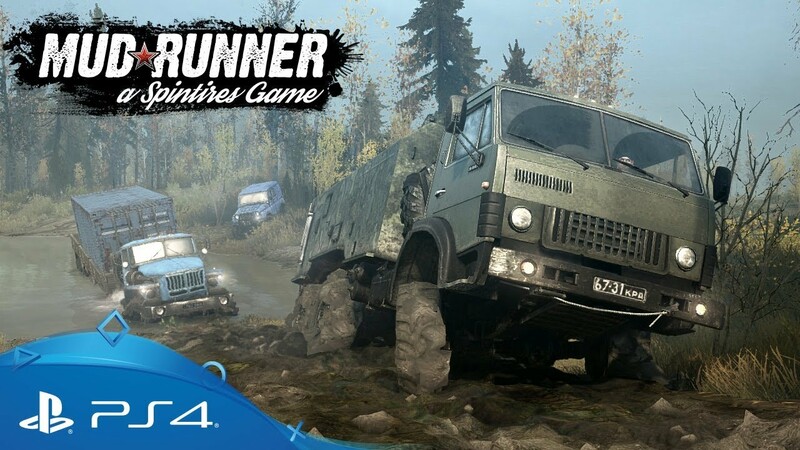 It deserves a look and truck drivers and the like are going to really lap this up as they will play it like the simulator it has achieved to be. You wont be disappointed.